Contact Jim Wagner at jwagner@indianachamber.com or 317-264-6876 for booth and sponsorship availability. Exhibitor Setup: 2:00 p.m. – 6:00 p.m.
Exhibitors can set-up your booths during set-up hours on Tuesday afternoon and/or Wednesday morning. Upon arrival, proceed to the exhibitor check-in desk near the exhibit hall. Our team will be there to greet you with your exhibitor packet and booth attendee passes. Tear down will take place Wednesday afternoon. The Indianapolis Marriott Downtown loading dock will be available for large box trucks only. 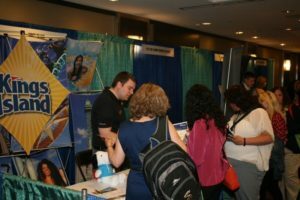 Exhibitors can also unload their booth materials at the front entrance of the hotel or the Missouri Street Entrance. Specific shipping instructions are included in the exhibitor kit from Excel Decorators which will be emailed to exhibitor contacts approximately 4 weeks prior to expo date. Please make sure to follow these instructions when sending your booth and related materials to Excel. Please make sure that you follow these shipping instructions carefully since neither Indianapolis Marriott Downtown, or the Indiana Chamber will be held responsible for your booth and its contents. 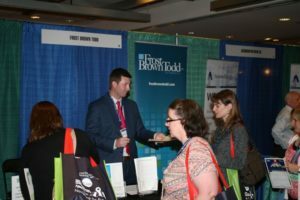 The Indianapolis Marriott Downtown is the official conference hotel for the 55th Annual Human Resources Conference & Expo. To reserve your hotel room at the discounted conference rate, please reserve your hotel room online or call (317) 822-3500 and request the HR Conference room rate by April 12, 2019. (subject to availability). Ample parking garages can be found around the Marriott Downtown. For a map, click here. Booths will be assigned approximately one month prior to expo date. The exhibitor decorator kit from Excel Decorators will be sent to you in late March. Excel Decorators is contracted vendor that will take care of your drayage needs and additional booth furnishings. If you have not received your email packet by March 31st, 2019, please contact jbrothers@indianachamber.com. We reserve the right to make changes in order to accommodate the sponsors and exhibitors who have registered this year for the HR Expo. The furnishings provided in each booth include a 6-foot skirted table, two chairs, signage, and a wastebasket. The Marriott Ballroom 5 and foyer is carpeted. Electricity and high-speed Wi-Fi is not included in the booth investment. You may order electricity through the Indianapolis Marriott Downtown should you need it. Wi-Fi is included. Wi-Fi login and password information will be provided onsite in the program guide. We anticipate 300+ attendees at this year’s conference. It will be the responsibility of each exhibitor to determine the winner of their prize at the conclusion of the HR Expo. 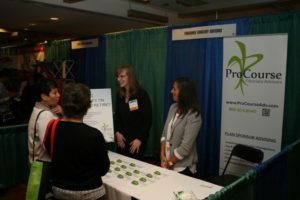 As the exhibitor, you are responsible for drawing names at your booth and either personally delivering the prize to the winning attendee, mailing the prize to their homes or writing the name of your winner and your booth number on the white board provided. More information will be provided at registration on the process. If you do not wish to participate in these drawings, you are not obligated to do so.